There’s nothing like a good camping trip to get one’s mind off of the daily grind. And there’s nothing like some quality camping gear to turn each trip into a comfortable and successful adventure. But what about in the offseason? Where do you store all of your tents, sleeping supplies, and cooking gear? With the best self-storage unit near me, you can tuck all of this away neatly to keep it out of your way in the winter and ready for action when it’s time for your next adventure. It might seem easier to dump all of your camping items together in a big cardboard box, stick it in the storage bin, and call it a day. But you’ll thank yourself down the road if you instead purchase a few stackable storage bins with lids. Organize your camping things into bins by categories—like kitchen and backpack—and clearly label each bin. With this system, you can even bring the entire bin to a car camping trip as-is and you’ll know just where to find that trusty camp stove. Do yourself a favor and wipe down your tent before storing it for the season so it will be nice and clean when you go to use it again. As always, you should let your tent air dry all the way before putting it in its bag. Before you stick your sleeping bags in storage, consider placing a dryer sheet or a cloth bag full of lavender flowers inside. This will leave your sleeping back smelling fresh when you pull it out again. Store your sleeping back in an airtight container along with other similar items like your tent and your sleeping mat. Be sure that when you are selecting a storage unit for camping gear that you opt for a climate controlled unit, like those at Cherokee Self Storage. These types of units will protect your gear from humidity, mildew, and pests. A comfortable mattress is so important for a good night’s sleep, but these assets are often not cheap to buy. So if you find yourself with an extra, quality mattress on hand with nowhere to put it, you’ll want to store it correctly so you can hang onto it for future use. Here are the best do’s and don’ts for storing a mattress in a self-storage unit. Before you put your mattress away in storage, make sure it’s clean. Use an upholstery cleaner and then vacuum each side. Now that your mattress is clean, you’ll want to protect it from fresh dirt and debris by wrapping it tightly in plastic. You can purchase a mattress cover at most hardware stores. Be sure that the plastic is breathable rather than heavy and thick. If you want to ensure that your mattress stays free from mold and bacteria (which, of course, you do) then you need to store your mattress in a climate-controlled space. It’s fine to move a mattress on its side, but if it’s left like this for the long term, its coils could shift and affect its shape and comfort level. Instead, store the mattress flat. Storing other objects on top of a mattress could result in similar problems as leaving it on its side, like damages to the coils. Instead, store the mattress flat and on top of other, stable items. When you’re ready to remove the mattress from your storage unit and put it to use once more, give it a good cleaning first. Sprinkle both sides with baking soda and vacuum it off to remove any odor. That’s all it should take to get your mattress ready to provide a good night’s sleep! Do you have a perfectly good couch and nowhere to put it? This conundrum might be great motivation for renting out a self storage unit from Cherokee Self Storage. Once you have a unit, you’ll find that there are lots of ways to use storage to declutter your home and stay organized—starting with storing an extra couch. A good rule when storing any item is to clean it beforehand. This way your belongings will be in great shape and ready to use when you pull them out of storage. Vacuum the couch before washing it according to the directions on its tags. 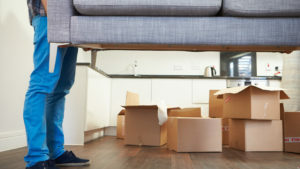 If you’re storing a couch along with other items, you need to be sure you have a storage unit large enough to accommodate these things as they should be stored. A couch is best stored in its natural position, so that there can be no damage to its springs or structure. Find a climate controlled unit that is large enough to let your couch sit normally while providing space for your other things. A quick way to ruin a couch in storage is to cover it in plastic. Your couch should be covered, but not with plastic! This traps in moisture which leads to mold and mildew. Instead, cover your couch with sheets, drop cloths, or furniture blankets. This will protect it from dust and debris. Try to avoid placing your couch directly onto the floor or the storage unit. Instead, first line your unit with plastic sheets or wooden pallets. This gives your couch extra protection. You should also try leave a little space between your couch and other items, including the walls, so that air will circulate around it, again preventing mold and mildew. Storage spaces are tools for home and life improvements of many kinds. They allow you to keep only the necessary and relevant things around in your home at all times, so that your living space can feel free of clutter, while allowing you to hold onto things you’ll need at a later time. This quality makes storage units the perfect tool for seasonal organization. As winter settles in, use these tips to make the most of your storage unit from Cherokee Self Storage. One of the best tools to staying organized is a checklist. Whenever you pack something away into your self storage unit, write it down on a spreadsheet so that you can easily find its location when you need it. As you store things away for the season, be sure you are marking the boxes as well as making note of items on a spreadsheet. You can label boxes by season, by number, or by whatever system makes the most sense for your needs and your items. When you go into your storage unit to retrieve your winter snow gear and Holiday decorations, don’t just stick your box of Halloween lights and pumpkin carving tools in the front of the unit. Instead, take a little extra time to push the spring boxes to the front, followed by the summer boxes, and then stick the autumn boxes in the back. This ensures that what you’ll need next is always easily accessible. Storage units can also serve as a place to stage current seasonal items. For instance, winter is a great time to save a corner of your unit for Holiday gifts that are waiting to be wrapped and handed out. In the summer, a storage unit could be used as a place to keep decorations and supplies for a barbeque or a party, while in the spring an accessible area could hold your gardening tools when not in use. It takes quite a lot of effort to plan a wedding day, but even after the perfect ceremony and reception has been executed there’s still work to do. Now that two people are beginning their lives together, there’s some organization to be done—with new gifts, used decorations, and duplicate items from each person’s life. Here’s how to simplify the daunting process of organizing post-wedding. First and foremost, don’t be afraid to ask a close friend or family member for help. This task can be a lot of work for just two people, and more hands will make it more fun, more relaxed, and less stressful. Your first task is to sort your items based on what you want to keep and what you don’t want to keep. Items that you do not want should be set aside to either sell, donate, or regift. Items that you do want should be divided into two sub-categories—those that you want immediately available in your home and those that should be stored. For instance, if you’ve been giving two excellent coffee makers, you might want to hang onto both, but one of them can be placed into a storage unit for safe keeping. Pick a climate controlled storage unit, like those from Cherokee Self Storage, that will offer enough space for the items you want to store. Climate controlled units are designed to protect your items from the elements. When you have collected all of the gifts, extras, and wedding decorations and accessories that you want to put in storage, it’s time to sort them yet again. Purchase some stackable, lidded bins and pack them with your items according to use. For instance, one bin can be decorations while one bin can be extra kitchen items. Label each bin, and consider creating a spreadsheet that will list the items in each labeled bin. This way, when your first coffee maker starts acting up a few years down the road, you can quickly locate your other one in your organized storage unit. Divorce isn’t easy on anyone. Dividing your assets and moving out of your old home are just two of many trying steps to the process. 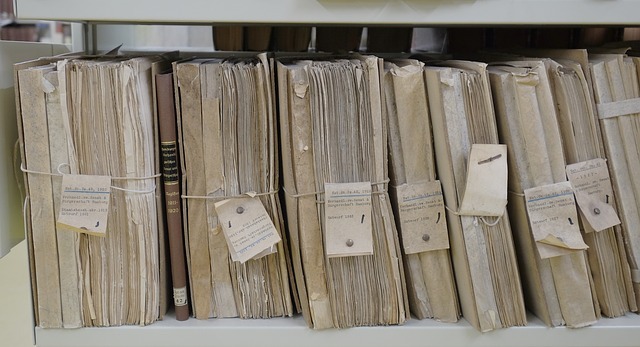 However, there are several ways in which having a storage unit can make this part of divorce more organized and less stressful. As you begin the process of divorce, you can immediately start distancing yourself from the experience by moving some of your things into a storage unit. Collect items that are unmistakably yours and bring them to a storage unit that’s close to your old home. 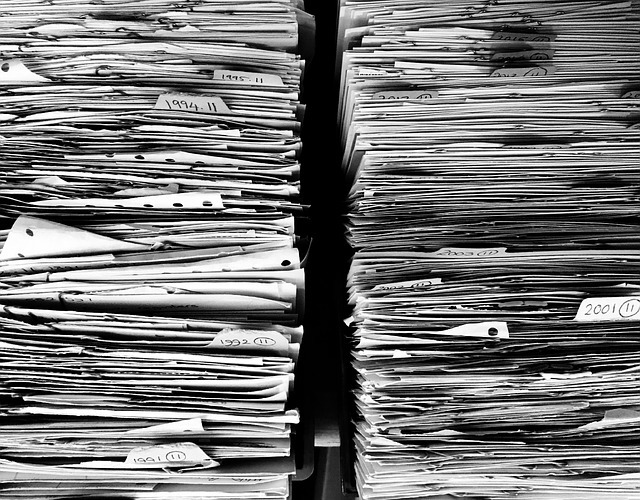 It’s important to stay organized throughout this process, so keep a running list of the items you have moved into the storage unit. This will help protect your from being accused of hiding assets later on. Renting a storage unit during a divorce is not only good for collecting your things, but it can also be good for downsizing in the process. As you move things out of your old home, be decisive about what you want to take with you in the next chapter of life. As long as you and your ex spouse can agree on what stays and goes, you can sell unwanted items and split the money later on. When you’re going through a divorce, you don’t want to rush into a new, major life decision, like buying a new house. Grant yourself a little time to figure out your next move by moving all of your furniture and belongings into the storage unit. You can revisit this space when you have time to go through the steps above, both sorting, organizing, and in some cases disposing of your belongings. Taking inventory of your belongings in a storage space can also let you decide what you may need to purchase on your own for your next house, condo, or apartment. When the time comes for you to move into your new home post divorce, your clothing, furniture, and other items will all be ready to move. It’s hard not to experience empty nest syndrome when your kids move away for the first time. After all, any type of change can be difficult, and when you’re left with a big, empty house it can be a challenging adjustment. After the shock wears off, you might find that downsizing can be a step towards a fresh start, a new chapter, and can help you organize your belongings and get rid of what you don’t need. Here are three things a storage unit can help with when you’re downsizing. If your kids have gone off to college, they may not have space for a lot of their belongings. 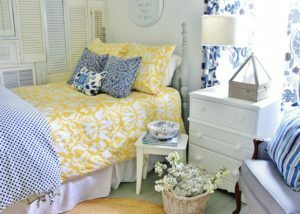 However, that doesn’t mean you ought to keep their bedroom together just as a storage space. Instead, rent a self storage unit away from home and use it to store items from their bedroom. This opens up the space so that you can repurpose the room to meet your needs, whether you turn it into a craft room, a music studio, a workout space, or whatever suits your fancy. Some parents might consider moving into a smaller home once their kids have left for college. As long as you have a storage unit on hand, there’s no need to toss out all of your belongings in the process. A climate controlled storage unit can be a safe and handy place to keep Christmas decorations, seasonal recreational gear, old photographs, and anything else that was once tucked away in an attic or basement. Downsizing your belongings or your home will likely mean getting rid of furniture you no longer want or need. But if your kids are in college, there may come a time in the immediate future when they’re looking for a new couch or a kitchen table. Keep large pieces of quality furniture in your storage unit so that it’s available as a hand-me-down to your kids without taking up space in your home. Wedding planning is no easy task, and the long to-do lists plus the many materials you acquire for the big day can make it a stressful one. One trick that can make the whole process feel easier and more organized is using a storage space to stage the wedding planning and preparation. A storage space can be transformed into your wedding office, your craft room, and the space where you keep all of your rented furniture, your tablecloths, your dishes, and everything else together in once place. If your wedding planning involves some DIY projects—as many crafty or budget-friendly weddings do—you can use a storage space as your project workshop. Set up a folding table, a chair, and a good light source. Plastic bins can hold all of your supplies as well as the finished products. Having your crafting station set up at a storage space allows you to work on your projects in steps without having the supplies clutter your home. Renting a storage space will allow you to get ahead on some of the more daunting chores of day-of planning, like picking up your party rentals. Store tables, chairs, and other important pieces of the setting in the storage unit. This keeps your house and garage clear of clutter, so you can keep a more relaxing environment at home. With the extra space in your storage unit, you can try setting up your tables as you plan to have them for the reception or other portions of the wedding. This will help you work out any potential kinks and to perfect the arrangement. You can prepare even more by sorting your decorations, programs, and other items into bins labeled with post-it notes. Finish off your day-of planning by writing up a step-by-step list for set up that refers to the organized bins for easy coordination. Your wedding dress is probably the most expensive clothing item that you own, and as a souvenir of your special day it’s worth far more than just its initial cost. 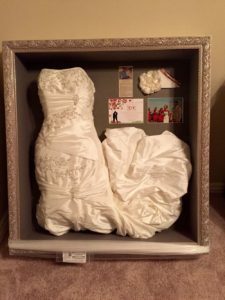 Use these tips to properly preserve your wedding dress in storage and your gown will live “happily ever after” too. lt someone with experience in wedding gowns. If you take your gown to a professional preservationist, they will often do the cleaning for you as well. Preservationists can remove any stains or make minor repairs. Afterwards, they will store the gown in a specially designed box or a special garment bag. 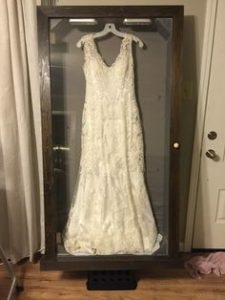 Another option is to purchase a DIY wedding gown preservation kit, but for the surest results professional preservation is probably the way to go. Gowns should be kept in cool, dark, and dry place. Humidity can cause damage, and sunlight can cause yellowing. Therefore, attics and basements are not recommended. 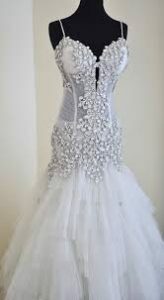 Experts suggest taking out your wedding gown from storage every two or three years in order to let it breath and refold it. When you do so, be very careful in opening its storage bag or box. Wash your hands before handling, or even wear a pair of clean, white, cotton gloves to keep your dress pristine over the years to come.